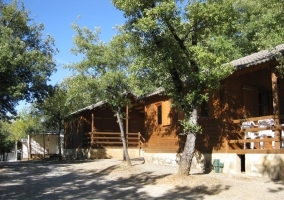 Accommodation type bungalow , with capacity maximum for 5 people. 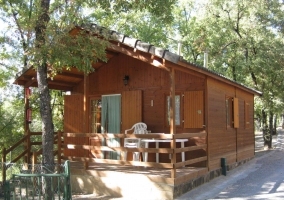 It has a wooden structure rustic look and comfortable , are surrounded by nature and overlooking the exterior. No towels or bedding. The está kitchen fully equipped, has the basic appliances and utensils available to huéspedes.Es stay open very funcional. La living room and dining comparten el same space, with a small seating area with sofa bed for a guest and a solid table madera. the first bedroom has a double c love with a ampia que window let you admire the vistas. El second bedroom has 2 single beds, with a large window that illuminates the entire stay, is the rustic decor of the entire casa. The bathroom is complete y very functional, it has shower y a more modero style. The porch ocupa ya great importance that will give you the opportunity to dsifrutar moments to outdoors admiring nature and tranquilidad. It has a single bedroom with double bed , it follows a decoration with wooden clad walls, it is a luminous space y comfortable. No bedding available. The bathroom is private with shower , no towels available. In the common area is the dining area with a wide table and a bank perfect lick for resting also. It is an open area very luminous by all the windows with views that this room has. The kitchen tambien in the common areas has necessary appliances, with sufficient household and very iluminado. The porch is quite big, it has a perfect rest area to use and enjoy the outdoors. 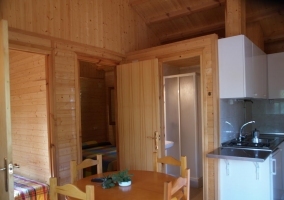 This bungalow rental accommodation has a maximum capacity of 4 people. It has a structure of dark wood according to the trees and nature that surrounds this complex. 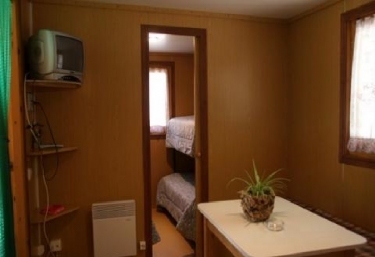 The second bedroom, with 2 single beds , storage space y a large window. No clothes available of bed no dormitory. The bathroom is complete and with shower , it is a bright space thanks to the window that it has. No has towels . 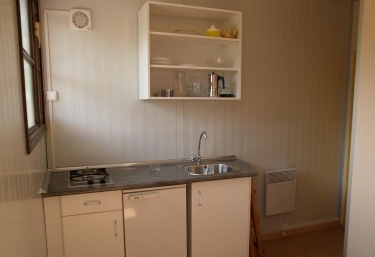 The kitchen communicates with the rest of the common rooms , is fully equipped with appliances basic and household . The dining room with a large table has a bank mullido perfect to rest, it is a very bright and overlooking the nature. The great porch with garden furniture is perfect to enjoy the good weather and traqnuility that is breathed. 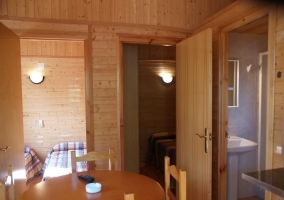 Mobile home type accommodation, with a fresher look thanks to a white wooden structure. It has a maximum capacity for to host 4 people. 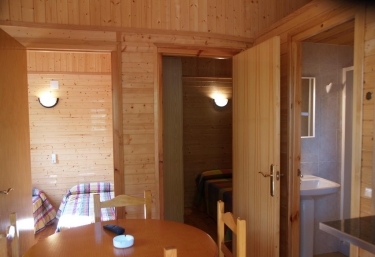 It has 2 bedrooms , the main one with double bed and a large window that completely illuminates the room.It has a rustic but cozy decoration. The second bedroom has 2 single beds also has a large window with stunning views of the mountains, has a cozy decor. The kitchen is equipped with basic appliances and kitchen , is a open that communicates with the rest of the common areas. The dining room area is very spacious, with a large table and several chairs, in addition to a bank mullido also perfect to rest. The bathroom is complete with shower y has window. No towels available. The porch is very spacious, has outdoor furniture perfect for enjoying meals outdoors. 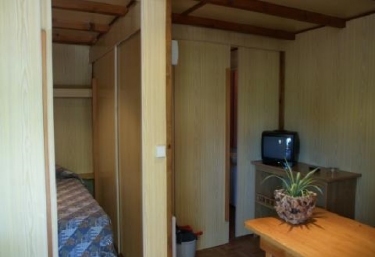 Accommodation type mobile home , with capacity for 2 people, is perfect for a vacation of couple surrounded by nature and tranquility. 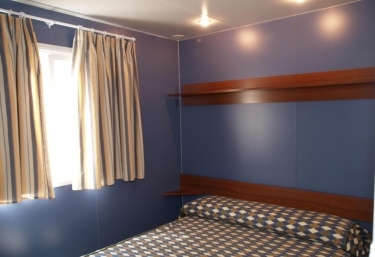 It has a bedroom double bed, with a large window that completely illuminates the entire stay. No bedding. The bathroom is complete with shower, is a functional and comfortable space . There are no towels. The fully equipped kitchen , with basic appliances, is a open space that communicates with the rest of the common areas. The zone of living room is formed with a sofa cama and a table , in addition to being very bright thanks to all the windows of the room. The porch is a perfect space to enjoy the fresh and pure air that is breathed in this place.